The new model numbers can throw you a little since they don’t make a numerical correlation from the old ones, so if you’re looking to make a lateral switch, we’ll start with the differences in models. The nine-color models: The Stylus Pro 7890 and 9890 are closest related to the new P6000 and P8000, respectively. The 11-color models: The Stylus 7900 and 9900 are closest related to the P7000 and P9000, respectively. The P6000 and P7000 are the 24-inch models, and the P8000 and P9000 are 44-inch models. Now, let’s get into the meat and potatoes of the printers performance statistics and notable changes that set the Epson SureColor P-Series at the forefront of image quality and print permanence. There is not much change in the looks department, as you’ll notice, they look almost identical to the previous models, with the exception of a few changes in color scheme and stickers signifying the different ink and print heads used. The most significant change is in the guts of the machines. Epson has reformulated a new ink that has now taken print permanence for water-based pigment technology to a higher level. Epson is boasting, with the help of the Wilhelm Imaging Research, of a print permanence up to twice as long as their prior ink set. The Epson UltraChrome® HDX 10-Color pigment inks also promise a better resin encapsulation for higher scratch resistance and deeper black formulation by 1.5 times the prior ink set. The latest precision core TFP print heads boast an upgraded dot (dithering) pattern for smoother transitions and more accurate dot placement. An onboard timer has also been set so that you can run print head maintenance cycles. This is a big improvement for those who do not have the luxury of being able to maintain the printer while leaving for a trip or just not using it for a couple weeks at a time. Now you can use the timer-based system and tell it to keep the nozzles fresh. There have also been advances to the coating used on the print heads to make them easier to clean, along with ink encapsulation that has a lesser clogging rate than the previous generation. We took delivery of our SureColor P7000 at the beginning of November and started our profiling and review of the machine. The most notable benefit of switching or adding one of these to your repertoire is the shear gamut increase the new ink formulation made. From old to new we measured on the same product a gamut increase of 17.4%. By the naked eye we could definitely see a deeper black and richer reds, but when comparing the gamut on a 3D and 2D map with both profiles of our newly acquired P7000 versus the Stylus Pro 7900 onto our most popular Sunset Photo E-Satin Photo Paper, the visual speaks for itself. The new printer gamut map triumphs over the old in a very uniform fashion, which means Epson has broadened the color spectrum on all corners of the map, not just in certain areas. 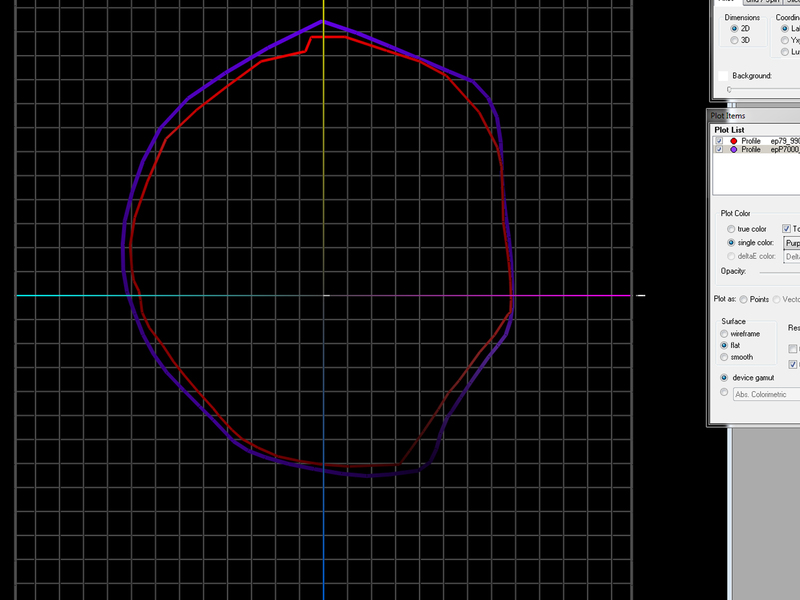 Pictured at left is the 2D outline of both gamuts new (*purple) and old (*red), side by side. It is hard to think that Epson could improve upon what image quality it has built its reputation on. You would have a tough time lining up an old print from the Epson 7900 and nitpick by the naked eye the differences in dot gain and dithering without getting under a loop. But, if you were gauging the image visually based on depth of color and density, you can definitely point out the old from the new. The colors seem to just jump out from the page. Epson has really hit a homerun with the new ink formulation. 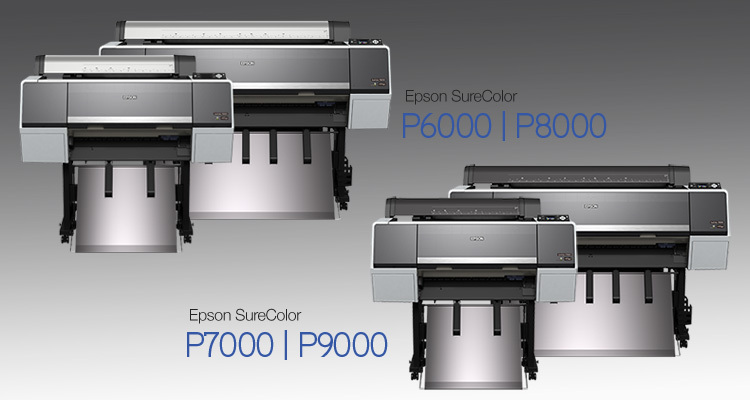 How do you take the previous Epson Stylus Pro Series and make it better with the new P-Series machines? Less user-based maintenance, higher color fidelity and durability and longer-lasting prints. Kudos to Epson for accomplishing all of the above and putting out a very promising machine! Call us at 800-453-9538 if you have questions regarding the differences in the machines or to find out which printer fits your business model. About the author, Michael Clementi: Going on 10 years with LexJet, Michael has played an integral part in sales of wide-format printers. Having amassed extensive product and application knowledge, Michael was named the head of LexJet’s “Experience Center” where customers can gain knowledge of wide-format printing with all technologies and applications. He is also a team leader in charge of LexJet’s Tech Support and installation division. Shellie has more than 20 years of experience in the print publication industry as a content strategist, editor and writer. She has partnered with printing, photography and graphics professionals on a wide variety of publications and printing projects. At LexJet, she writes about customer experiences, industry trends, new products and the latest inkjet printing innovations. I had the chance to print only 2 tests on an P9000. The paper was VFAP ,with the VFAP mk profile from Epson Europe and mk ink set . to the tests from my 9900 printed by the same way. There are a lot of variables in the question you had posed so if you need us to print more tests so you can ensure you are happy with the accuracy and print quality of the newest machine please let me know. I will be happy to oblige. If you are in the neighborhood of Sarasota Fl, you can also stop by our experience center and I can sit with you and we can run the prints together. If you have a file you would like a sample print on the P series you can email me at Michael.Clementi@lexjet.com. Or if I can help further with your questions please don’t hesitate to reach out. Thank you for your reply to my review! And of course thanks for reporting! We have been printing with a P9000 for a couple of weeks and are seeing both an increase in saturation and some a sense that there is some general darkening of the printed output per the previous comment. It is all a bit subtle and I suspect it is mostly getting used to something new. I perceive and believe that what the reviewer is saying is accurate regarding increased gamut and other factors and it is clear that it is going to take some taming to learn to use this printer in its full capacity. I am creating new icc profiles for most of the papers we are using including Epson’s as the stock profiles don’t quite work for me and many non-Epson paper manufacturers have not yet created profiles for the P9000. 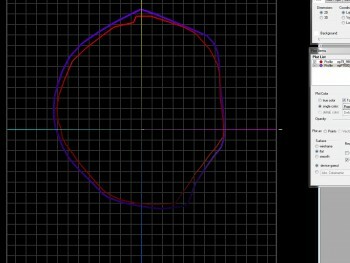 It is interesting that I see tiny “pits” in the gamut maps in the profiles made by an xrite i1pro spectrometer of the output of this printer. Not sure what that means. I have never seen those before in a printer profile. I haven’t had the chance to compare gamut maps of this printer with the 9900 we were using. The reviewer doesn’t mention whether he is referring to which model he is using, the commercial model that replaces LLK with violet or the standard one that doesn’t. The violet is designed to increase the gamut to include 90% of the pantone colors, something useful for graphic artists making proofs for offset printing. We are using the standard model as we print artwork and photography and were told the standard model that retains the LLK ink is superior for that purpose, giving up only a minimal increase in the blue gamut. I hope the print heads and inks are more robust, as the reason we bought this printer was the failure due to head blockages after 4 months of printing with a brand new Epson 9900 print head using Epson 9900 inks. The clogging rate for that printer was just too much of a challenge. It almost made us quit Epson and cost us a bundle. Thank you so much for your reply. Just to clarify, I am using the standard series P7000 not the commercial edition. The big increase in gamut if you look at the gamut map in the blog post (click it to enlarge it) includes much deeper colors so the “darkness” could be due to the colors that the previous generation could not print. The “saturation” increase can also be due to an increase in colors that can be attained with the new ink. Like I stated, we noticed a rise in the depth of the image from the old to the new so a visual difference when switching to a larger gamut completely new ink formulation is to be expected. It should, in essence, be truer to what you see on your screen since you have more colors to print if you are going the length to create or use custom profiles for the media you print with. But again I can only assume without knowing specifics about settings and such that this may be possibly a part of what the original poster was seeing as a darker and over-saturated look. On the violet ink version, customers who are not into Pantone color matching or proofing will go with the standard P-Series. The light light black was brought into the ink set to help diffuse bronzing and to help prints become more continuous tone. This cartridge is very important for anyone using any materials that have a shine to them (gloss, satin, semigloss, semi matte) since you will see these negative effects more evident on surfaces that refract or reflect light. Kenoli, why did you purchase another Epson after the print head failure in the 9900? Does the new printer require a service tech to change print head or can the consumer do it? I just purchase the new P-9000 from Lexjet and find the color to extremely accurate. Reproductions are far more neutral than my old printer when using ICC profiles. I use both downloaded profiles and those I make with my Eye-One. However I don’t solely rely on profiles. I have found the prints to be to dark overall but vary linear. All are corrected after printing a file I set up using Kodak’s “Color Control Patches”, Kodak’s “IT-8 (Q-60)”, and a file downloaded from Color-Sciences web site “Digital Printer Test Image”. I then use Advanced Media Control in the Print Settings window. It’s been my experience that printing strictly by the numbers is not as perfect as you might think. This was also true in the old days using wet chemistry in a photo lab. just purchased a P6000 and am finding my prints to be much darker than prints from the same file on a 7890 that I can also use. I have also made prints form the same files on a P600 and they match up with the prints form the 7890 much better. This is frustrating. I am an experienced printer and know that I’m setting up the printing workflow correctly and the same for all the printers. I am using window 7 64 bit. I noticed that one of the paper choices in the Driver is Archival Matte, this paper is at least 10 years old and have no idea why it is included. I think it is the wrong driver. Any thoughts about any of this would be much appreciated. Hi Frank, One of our printer experts will reach out to you to help. One of my friend and I are having big discussions because we can’t find real bottom line info from Epson (aka your 17.4 % measurement for the gamut). If we buy a P8000 instead of a p9000 (both being 44 inch) what do we REALLY lose ? ANd if we buy a p20000 that has 2 colours less but a black more, what do we really get ? If we really get something, why don’t they make a p9000 with 4 blacks also ? Thanks for answering if you have any idea about that ! The difference between the P8000 and the P9000 is that the P9000 has orange and green inks. Because I do not have those two printers on hand, I did a comparison to Epson’s 7890 vs 7900, since the difference is that the 7900 has orange and green, too. The image shows the 7890 versus the 7900, where you will see the color volume numbers are larger on the 7900. I would expect the same results in comparing the P8000 and P9000. As for the P20000, I can let you know the answers to this when I receive my beta unit, which I believe will be towards the end of this month. I’ll keep you posted. My guess is that the additional blacks have more to do with a speed of printing increase, but again, I will have more hard data when I get the machine and test it. I am thinking of purchasing the P7000, upgrading from a 3880. I am not a professional, will not use it every week. Based on what you’ve seen so far, do you recommend it? Is the periodic flushing working or in the long run, will this use quite a bit of ink, such that if you are not using the printer at least weekly, you would not recommend it? If you used a 3880 in the past and have not had an issue with maintenance, then the timer-based cleaning feature of this printer will be a big plus for you. I can tell you that since we started using the timer-based maintenance function with our P-7000 coupled with the new printhead technology in the printer, it seems to be a bit more forgiving with clog issues. The only channel that will clog faster, since it is heavier pigment, is in the Matte Black. So far upkeep seems to be less by about half when using the new timer. My shop runs a 7880 [7 years] and a 9900 [3 years]. I run about 100 feet of Epson Luster a month per machine. I realize the 7880 is older, but believe it delivers better skin-tone color than the 9900. Although the 9900 tends to produce deeper colors, it also tends to oversaturate the reds. Reading that the reds in the P7000 are even more intense is a concern. Both printers are running stock Epson profiles. Unlike many, I have had excellent success with the two printers and have had no issue with clogging, albeit the 9900 does need to be run a bit more than the 7880 ensure a nozzle is not lost. I just purchased the P7000 and wanted to know if it is best to always keep the printer on when not in use. Just don’t want to have any issues with printhead clogging. Yes keep the printer on. If you are going to do this use a surge protector or battery backup /surge protector combination. Your experience and comments with new Epson P20000 printer and is it worth the high price tag. My application is fine art printing and reproduction of art works. Thank you for your inquiry into the P20000. If you are strictly trying to reproduce the highest possible color gamut, I would still use the P7000, P9000 series printers to do so. Even though we haven’t had a chance to test out the new P20000 and run gamut testing on it, by looking and comparing ink sets that are going to be used, I feel that the P9000 (44 inch) machine may still slightly edge out the P20000 with regards to color gamut. If you are looking for speed and a larger width with still incredible print fidelity, then the P20000 should be a hot commodity. The extra black in this ink set should allow you another step of detail within the darker shadow areas and smoother looking black and white prints. Hi Russ – It’s best to keep a higher humidity above 70% if possible for this type of head. The dry air probably did not help your cause much on your 7900. I would recommend the same with the P7000 as the technology of the head is similar. They have made it better with their timer-based cleanings that can be automatic if set. That will help keep the nozzles fresh also. The worst thing you can do for an Epson is not run it. They are meant to produce on a daily basis, and if possible, on your days off run a nozzle check to keep the head fresh. does the p9000 has the same clog problem than old 9900? what is the difference beteen standard and comercial version? and the difference between p9000 and p10000? 1) Try to keep a dust-free environment – This is #1 for a reason. Dust is the biggest clog factor. An air scrubber can help, but also place the printer in a separate smaller room with no carpet or cutting. 2) Run a humidifier and try to keep humidity above 75%. 3) Run a print on the printer even if it’s just a nozzle check to keep the nozzles fresh. The printer needs to be running regularly. The less it runs the worse it is for the nozzles. 4) If it is not running, put a dust cover over it (a sheet of plastic is fine). Cover the media going in so that dust is not settling on the material as it goes into the print zone. ok.. and what is the difference beteen standard and comercial version? and the difference between p9000 and p10000? I purchased this just over 1 year ago April 2016. I only ever printed 225 pages in total in that short time and now July 2017 the printer is broken. Hi Karl, We’ll have someone reach out to you on this issue. Thanks! I’m wondering about the pros and cons between the SC-8000 vs the SC-9000; there is about a $1500 average price differential. We use our current printer semi-infrequently, a few times a month at most. Hi Ellie – The price difference is purely based on the increased wider color gamut of an estimated 12-17% larger (depending on the paper used) of the P9000 over the P8000. The two added colors of Orange and Green are the reason for the difference in gamut. While your cost per print increases ever so slightly with 11 colors versus 9, the printhead and parts in the printer are EXACTLY the same. Speed performance does not change either. One thing to consider: We have more profiles for the P9000 due to the fact that we have that printer here to profile it in house. Any profiles for our papers for the P8000 have been made externally by our customers who have offered to share them with others. If you are looking at which way to go if support, available profiles and overall color gamut matters to you, then I would lean in the direction of the P9000. If you are concerned with overhead cost (keeping 2 more inks on the shelf) and don’t mind not having the profiles/extra gamut then save the money and go for the P8000. Just know that they are going to both perform to Epson quality standards and both are excellent options.